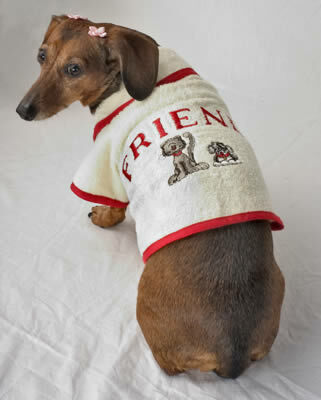 Jessicas Original® dog bath robe is made of high quality terry cloth inside and out. Jessicas Original® dog bath robe is much thicker for more absorbency. It has Friends with a dog and cat embroidered on the back. Jessica's Original® dog bath robe is trimmed in red and fastens with velcro® under the chest, easy on and off. It is 100% machine washable.